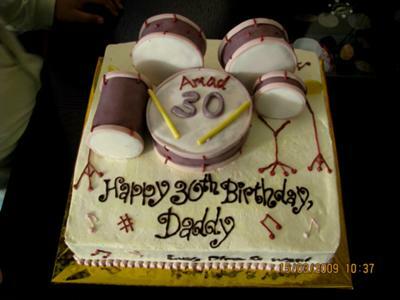 This drum set cake is for an adult birthday. First of all I baked a 10"x10"x1" sponge cake. Then I used large, medium and small size of round cookies cutters to cut out spongecake for the drums. Then the drums are cover with MMF fondant. Thanks to Nancy of CA for the recipe. It so tasty and easy to make. The bottom cake is a 10"x10" Red Cabbage Buttercake frosted with Cream Cheese Buttercream. To assemble the drums. I used a lot of toothpicks to keep them in place so you won't get nerve breaking during delivery. it's beautiful. I would like to make something like this. You always do such perfect work!!!! I sure wish you and Nancy and I lived close to each other!!!! Join in and write your own page! It's easy to do. How? Simply click here to return to Drum Set Cake.